Although the first documented discussion of eyeglasses dates from the late 13th century in Italy, many cultures had discovered the magnifying property of convex glass lenses much earlier. English friar Roger Bacon (1214-1292) wrote about his observations of convex glass and noted that it would be useful for those with weak eyes. There is evidence that by 1591, tinted lenses were used as protection from bright sunlight! 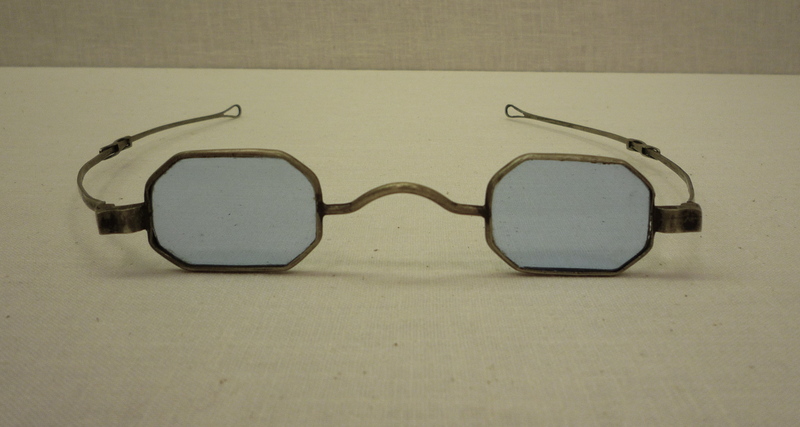 In the 17th and 18th centuries, tinted lenses were often used a second set of lenses and attached to spectacles by a hinge. 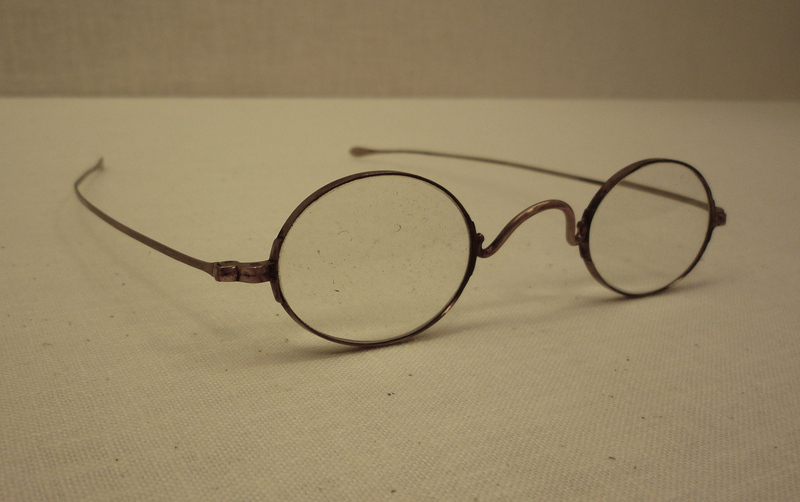 The first eyeglasses consisted of one lens on a handle. Later, two lenses were strapped around the head using leather or silk bands. The modern, hinged temple was not introduced until the late 1700s. Before lightweight plastic and metal alloys were invented, frames were made of brass, iron, nickel, horn, bone, gold, silver, or leather. In America during the 1700s, ready-made glasses were imported from Europe. They were expensive and unaffordable for most colonists. In the early 1800s, eye glasses were manufactured in the United States with glass lenses that were still imported from Europe. These ready-made glasses were sold by peddlers or jewelers and customers fit themselves. It was not until the 1870s that Americans learned to make optical-quality glass and to grind the lenses to specific standards that could be prescribed by optometrists. These new skills developed at a time when literacy rates were rising and more people required glasses. By the turn of the century, American-made lenses were being exported to Europe! 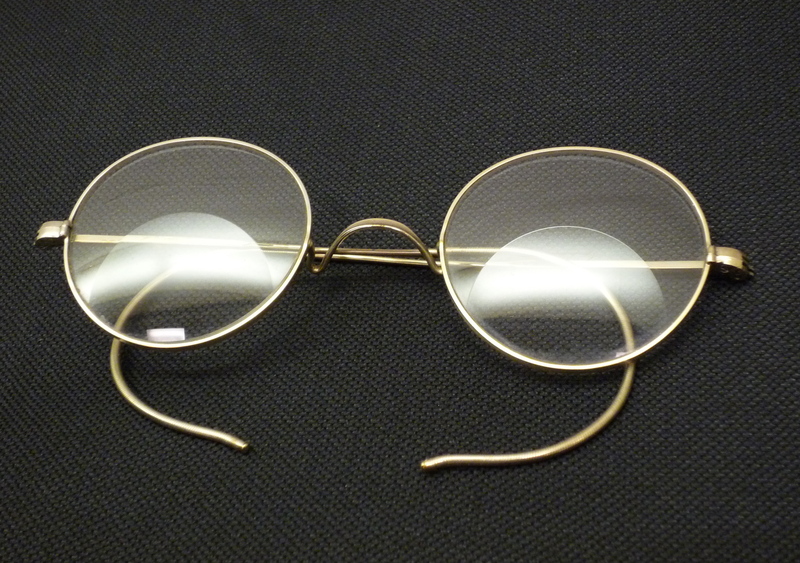 The first bifocal lenses were made by Benjamin Franklin around 1784. He made them by cutting two lenses in half and fitting them in one frame. Previous Post Hear the Iron Lung at work! You should have more facts about the history of sunglasses!!!!!!!!!!!!!!!!!!!!!!!!! !